Our food journey begins in Matteo’s home region of Emilia Romagna! Famous for it’s food & hospitality! Matteo’s home is a 20 minute drive from the Adriatic Coastal towns of Milano Marittima, Cervia and Cesenatico or well over an hour in peak summer season. Italians and foreigners flock to these seaside destinations for the sun and to be seen, Milano Maritima being the most famous for VIPs and people watching. Personally I prefer the beaches on the Mediterranean coast in Liguria however it is well known the hospitality you will discover in Emilia Romagna is far superior. August is the peak summer season, I would try to avoid it as it’s the most expensive and sometimes the beaches have to be closed because of the water quality…ahem yes which can be quite uninviting. Italians, as I discovered, don’t necessarily go to the beach to swim and for crystal clear waters, more for the right “Bagno” with a good bar/restaurant to meet up with friends. Milano Marittima comes alive at night time with bars, restaurants and shops staying open till late in the summer season. Matteo’s first kitchen job was in Milano Marittima at a bar/restaurant called “Loco Squad”, we still love going there in summer time with it’s casual yet romantic setting, delicious food and a great wine selection. It is always first on our list! 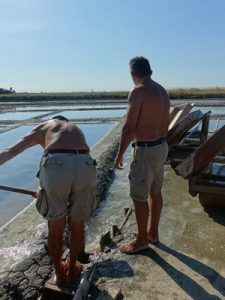 Perhaps the most historic produce from the region is the Sale di Cervia from La Salina Camillone, sea salt has been harvested here since Etruscan times (pre-Roman). In summer from June to early September you can take a guided tour and watch the salt harvesting process on Thursdays and Sundays, and purchase bags of this delicious seasoning to take home. 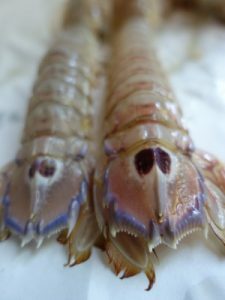 As Matteo say’s, the earlier you go the better and always look for locally sourced produce – Matteo loves Triglie (Mullet), Cannocchie (a crustacean most similar to Morton Bay Bugs with a sweeter taste), Vongole (clams and he prefers the smallest ones), Seppie (little cuttlefish) Alici freschi (fresh anchovies), Sgombri (Spanish Mackerel), Rombo (Turbot), Ali di Razza (sting ray wings) and my personal favourite wild caught Branzino (Sea Bass) and Orata (sea Bream) – these won’t be inexpensive but are absolutely delicious. We have been coming here for years! Best coffee and brioche I have found and a great location near to the seaside. Note the Piazza/car park is full on Thursdays for the market! This is not about food, but everything else! 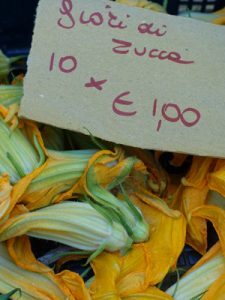 Every Thursday throughout the year this outdoor market consumes piazza Andrea Costa, note that if you are wanting to park near the shops / cafes in Cervia it’s best to avoid the Piazza on Thursdays! This was the place of Matteo’s first summer job in a kitchen! Very cool bar and osteria, meet for a drink and people watch or stay for dinner and listen to their cool tunes. The second restaurant of Ristorante La Buca, this osteria is one of the first (of very few) restaurants right on the beach in Milano Marittima. They are family friendly, do a great fritto misto (fried little fish, prawns and calamari) but don’t ask for any lemon! I love taking the kids to the beach in the morning and walking over for a lazy fish lunch with a glass of chilled Verdicchio! If you would prefer more elegant dining La Buca is beautiful, generally best to order the tasting menus on offer so you can try more dishes and keep your budget under control! This is our all time favourite restaurant in the area, old school but fabulous. I’d go with the waiters recommendation but must have is the risotto “alle Vongole” which comes to the table in a copper saucepan, it’s a generous serve for a minimum of 2 people. Opened by friends on Matteo’s, this is a fabulous place to eat outdoors in summer offering regional dishes from Romagna with a modern touch. Note: take insect repellant for out door dining! Named after the owners (the chef and his partner Mi) this is a relaxed but elegant restaurant and about 10 minutes drive from downtown Milano Marittima. Great fresh produce and another modern take on regional dishes. Another seaside place Matteo worked at in his early chef years. This is such a great place, owners Alessandro (Dusman) and Alessandra year in year out are the best hosts. They offer everything from beach beds (lettini), lunch, dinner and their beach bar is perfect for an aperivito. We generally go for the day, have lunch and a bottle or two of wine from their great wine list and relax for the afternoon and into the early evening before heading home. Dusman is passionate about wine and always has new discoveries for us to try each year. 367 is the number of the Bagno, which means there are plenty to choose from but this is our favourite. If you are looking for some great wine for your holiday the Wine Market has always been great. There are Piadinarie everywhere in their striped tents cooking delicious piadina to order which is always a great street food option for lunch or an afternoon snack! Matteo’s favourite is Proscuitto di Parma, Stracchino ( fresh spreadable cheese from cows milk) & Rucula.